Gary Neville was born in Bury and grew-up in a sporting family. His father was a cricketer, his younger brother Phil is also a professional footballer, and his sister Tracey has played netball for England. Neville joined Manchester United when he left school. He was a member of the successful youth team that won the FA Youth Cup in 1991-1992. He began as a central defender, but moved to right full-back when he didn’t grow tall enough for the centre of defence. His first team debut was in 1992, when he came on as a substitute in a UEFA Cup game against Torpedo Moscow. His first significant season was 1994-1995. Since then, he has been part of eight Premiership winning sides, including the one that won the treble in 1998-1999. He made his England debut in 1995 against Japan and has gone on to win eighty-five England caps. 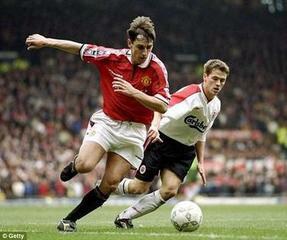 In 2005-2006, when Roy Keane left Old Trafford, Neville became club captain. 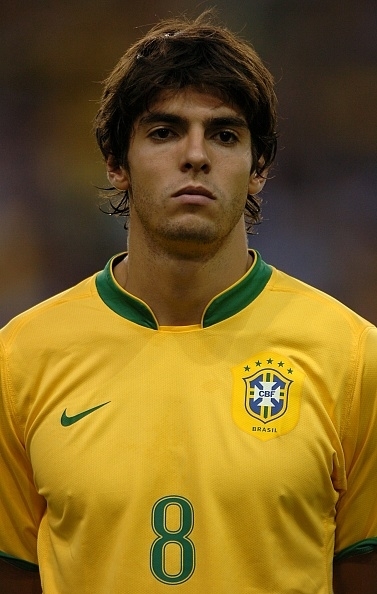 He suffered an ankle injury in March 2007 and was out of action for about a season and a half. He returned to the side during the 2008-2009 season, but is now no longer a regular starter. Neville has always been a committed and reliable player. He has been an attacking right full-back, as well as a courageous defender. For a number of seasons he formed a very effective right-side partnership with his friend, David Beckham. Strident in character, he has often played the shop-steward role at Old Trafford. He has combined loyalty to colleagues with a passion for the club. He has spent his whole career at Manchester United and no player has proved more dependable. No other full-back has made more appearances for the club and no other right full-back has won more caps for England.